It can be a challenge when shopping for air compressors to get one that is going to meet your needs. First, you will need to determine if you need portable or stationary, then your available power source...do you need a gas drive or electric? What is your available voltage...Single Phase 115 or 230 Volt or Three Phase 208-230 or 460V. Once we have answered those questions, we want to take a look at how much air you need by looking at your pressure requirements (PSI) and required volume (CFM). Single stage air compressors typically have a max pressure around 125-135 psi and two stage around 175 psi. To get a feel for how much air (CFM) you will need, you can figure roughly 4-5 CFM per person in an automotive shop and 12-15 per person in a body shop. Once you determine the CFM you need, take that figure times 1.25 and use that total CFM to choose your compressor. For example: 3 mechanics (12-15 CFM total x 1.25 = 15 to 19 CFM) So you would look at a 5 - 7.5HP air compressor. That allows for a 75% duty cycle and should help you get a compressor large enough for your needs. 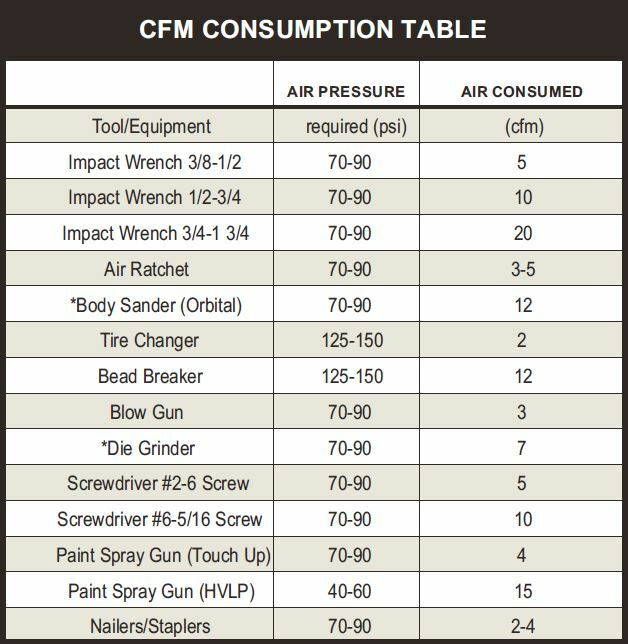 Of course, the CFM requirements for different tools varies, so here is a chart that gives some estimates on some common air tools that may also help you determine which compressor is best. Please do not hesitate to call or text 803-339-0445 or e-mail Sales@CompressorPros.com if you would like some help.